Microsoft Canada and Xbox Canada has a great sale going on! Save $130 off and get a FREE game when you buy Xbox One X 1TB Console – Fallout 76 Bundle. Bonus Gears of War 4 digital code (emailed 10 days post-purchase) plus other offers with purchase. This promotional bundle includes: Xbox One X 1TB Console and Xbox Wireless Controller. 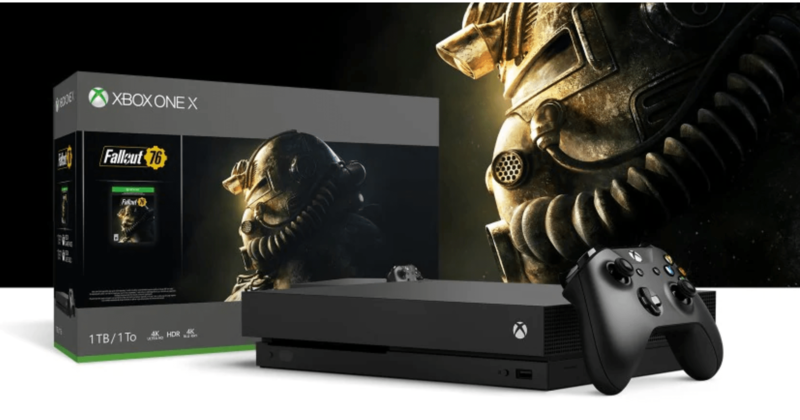 The Xbox One X Fallout 76 Bundle, which includes a full-game download of Fallout 76, the prequel to the award-winning RPG series from Bethesda Game Studios. Explore, quest, build, and triumph in a vibrant, post-nuclear wasteland.